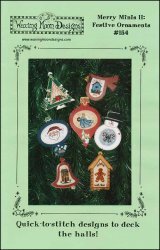 Merry Minis 2: Festive Ornaments [H6022] - $8.00 : Yarn Tree, Your wholesale source for cross stitch supplies. Cross stitch pattern by Waxing Moon Designs. Seven quick-to-stitch designs to decorate your tree. Stitch count: Peace Candles 40 long x 34 wide, Angel 31 long x 45 wide, Holiday House 37 long x 34 wide, Gingerbread Man 50 long x 23 wide, Santa 30 long x 44 wide, Candy Canes 36 long x 36 wide, and Holiday Birdhouse 34 long x 23wide.